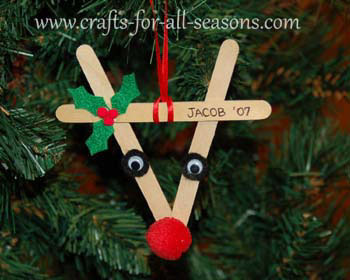 This cute reindeer ornament is wonderful for children to make. This makes a great school craft. 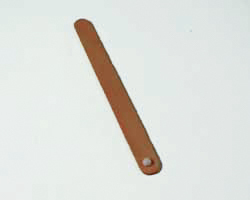 The popsicle sticks can be bought in bulk and are very cheap. The only other things needed are some felt, foam board, or construction paper, a pair of googly eyes, and some red pom-poms! 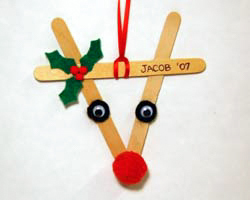 Each ornament can be marked with the child's name and year if desired. Keeping to really simple crafts for preschoolers is key. If you are working with a class, you may find some children lose their attention quicker than others. 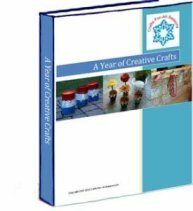 This craft is pretty quick to put together, without needed too much eye and hand coordination. 1. 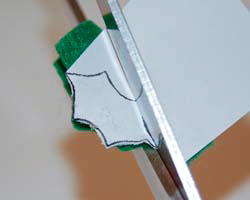 Begin by placing a drop of glue on one end of the craft stick and add another one top of it, in a V-shape. 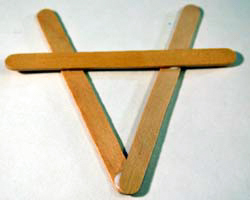 Then, glue one craft stick perpendicular to the V shape, about an inch from the ends. See photo below for help. 2. Next, glue on the large red pom-pom to the end point of the triangle, to be the nose. 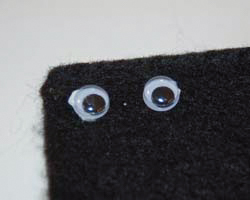 Glue the googly eyes some black felt. When they are dry cut them out, leaving a black border around each eye. Then glue the eyes to the reindeer head. 3. 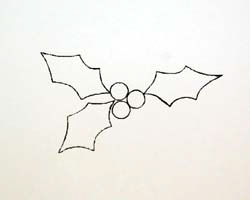 Print out the holly template by clicking here or on the image below (a new window will open, Adobe Reader is required) or just draw the holly free-hand. Fold a piece of green felt in thirds, so you only have to cut out the pattern once to get three holly leaves. Cut around the pattern carefully. 4. Glue on the leaves to the top craft stick at the side, and glue the three little red pom-pom glues in the middle. Add a cord for hanging in the middle, and add on the child's name in black marker if you wish.